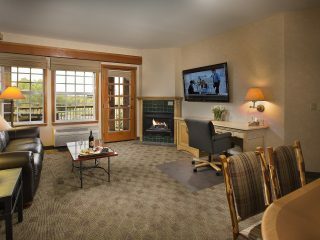 The Parlor Suites here at The Heathman Lodge are equipped with a fireplace, a Jacuzzi tub and shower and a balcony to unwind and relax. They also include a separate living space with a dining table able to sit six people. Please call 360-254-3100 for availability on suite type rooms.